Today we will see how the constructor and class-constructor triggers at runtime. Whenever we instantiate the object using the statement CREATE OBJECT statement, CONSTRUCTOR would be called. System creates an object before it calls the CONSTRUCTOR method. This type of constructor is the static constructor. This would be automatically accessed when system accesses the class for the first time. CONSTRUCTOR( ) is called when we instantiate the object, whereas call of CLASS_CONSTRUCTOR( ) method is different based how the class is accessed. Let’s see it in details using this Classes. Each of this class has a CONSTRUCTOR( ), a CLASS-CONSTRUCTOR( ) and a Constant except class LCL_C. CONSTANTS: c_a TYPE char1 VALUE 'A'. WRITE: / ' Class Constructor A'. WRITE: / '  Constructor A'. CLASS lcl_b DEFINITION INHERITING FROM lcl_a. CONSTANTS: c_b TYPE char1 VALUE 'B'. WRITE : / ' Class Constructor B'. WRITE : / '  Constructor B'. CLASS lcl_c DEFINITION INHERITING FROM lcl_b. WRITE : / ' Class Constructor C'. WRITE : / '  Constructor C'. 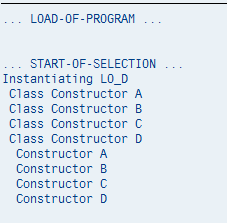 CLASS lcl_d DEFINITION INHERITING FROM lcl_c. CONSTANTS: c_d TYPE char1 VALUE 'D'. WRITE : / ' Class Constructor D'. WRITE : / '  Constructor D'. CONSTANTS: c_z TYPE char1 VALUE 'Z'. WRITE: / ' Class Constructor Z'. WRITE: / '  Constructor Z'. WRITE: / '... LOAD-OF-PROGRAM ...'. WRITE: / '... START-OF-SELECTION ...'. WRITE: / 'lcl_d=>c_d  ..... ', lcl_d=>c_d. This code accesses the constant C_D of the class LCL_D. It has executed all the CLASS_CONSTRUCTOR( ) of the higher classes in class hierarchy of class D i.e. Class LCL_A, LCL_B, LCL_C and LCL_D in the sequence. It didn’t execute the CLASS_CONSTRUCTOR( ) of the Class LCL_Z because we are not referring to any component of that class. DATA: lo_d TYPE REF TO lcl_d. Second scenario, in which we instantiate the object reference to LCL_D. 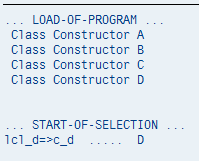 You can see that the CLASS_CONSTRUCTOR and CONSTRUCTOR were not called before START-OF-SELECTION. They were actually called when the CREATE OBJECT statement reached. So, instantiating the object has first called the method CLASS_CONSTRUCTOR( ) of the higher classes in the class hierarchy and then all CONSTRUCTOR( ). Which class-constructor calls first when both classes are not related? WRITE: / 'lcl_z=>c_z  ..... ', lcl_z=>c_z. WRITE: / 'lcl_b=>c_b  ..... ', lcl_b=>c_b. Wow! Too many different execution paths! System first encountered LCL_Z=>C_Z. So, it has called the CLASS_CONSTRUCTOR of the LCL_Z. After that it encountered LCL_B=>C_B. Thus, it calls the CLASS_CONSTRUCTOR of the class hierarchy of the class LCL_B i.e. 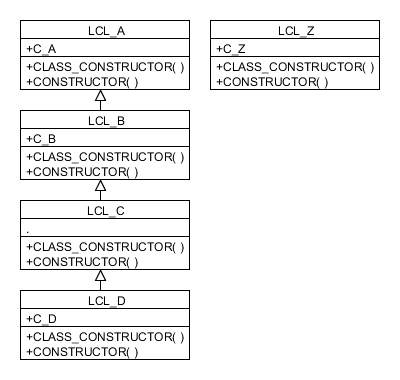 CLASS_CONSTRUCTOR of classes LCL_A and LCL_B. Now, when we instantiated the object LO_D, system calls the methods CLASS_CONSTRUCTOR( ) of the remaining classes of the class hierarchies i.e. method CLASS_CONSTRUCTOR( ) of classes LCL_C and LCL_D. 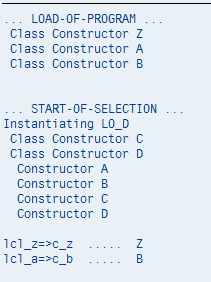 It doesn’t call CLASS_CONSTRUCTOR( ) of the classes LCL_A and LCL_B, because they were already called when it has encountered the access to constant LCL_B=>C_B. It's the best way of explaining static/instance constructor. Helps a lot in getting clear idea of this concept. Wow… You are a true Contributor. Thanks very much. Great !! .. Well explained with examples.. Thank you so much..
U r amazing! true didcation towards knowledge transfer! can you please tell me the purpose of a constructor?